We've arrived at the final installment of our 5th anniversary celebration, giveaway #5! Of course we're going out with a bang, so the great folks over at Casa Della Stilografica provided a beautiful prize to give away: a brand new LEONARDO OFFICINA ITIALIANA MOMENTO ZERO FOUNTAIN PEN (red marbled resin or deep blue resin color, not depicted above). If you want to win this beauty, all you have to do is enter in the Rafflecopter widget below, easy peasy! The rules are the same: just enter below and complete one or more tasks. The more tasks you complete, the more chances to win! This giveaway will run for three days, starting today. RULES: Open worldwide! Giveaway ends 7/24/2018. Winners will be chosen via random.org, and announced in a separate post. The winners will be contacted directly via email, if he/she fails to reply within one week, a new winner will be picked. Only entries with valid email address are eligible to win. Invalid entries are denied. Want to stay up-to-date on current giveaways? Follow The Pencilcase Blog on INSTAGRAM, TWITTER, GOOGLE+, or subscribe to the NEWSLETTER! Looks like a beautiful pen to me. If I could only own one fountain pen, it would be my Pilot Vanishing Point! Such convenience. My Nemosine Fission Fountain Pen with a 0.8 mm Calligraphy Nib. Incredibly generous giveaway! Thank you for offering this beautiful pen to one of your fans! The good old Bic Criterium 550 I used to chew up at school... Thank you for the giveaway ! If I could only own one pen, it would be a vintage Mabie Todd Swan with super flex nib. 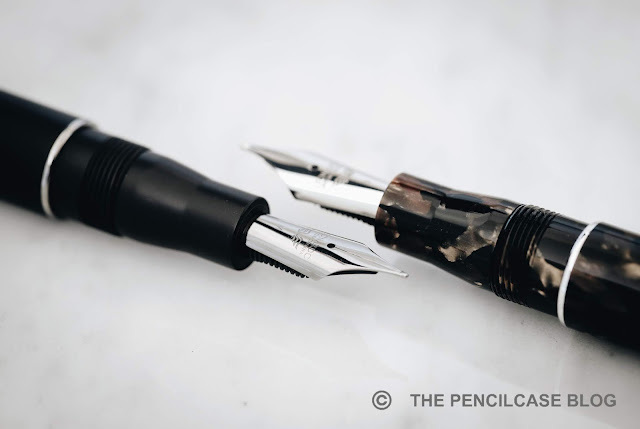 I absolutely adore mine, because of the history behind the pen and because of the super flexible nib! If I could only own one pen it would be the Montblanc 1912. One pencil... it would be a Blackwing. Easily the Lamy 2000 would be my "one fountain pen setup." You ask a difficult question, but I will give it my best answer - Parker 51 with medium nib. It would be fabulous to carry a LEONARDO OFFICINA ITIALIANA MOMENTO ZERO FOUNTAIN PEN along for the ride! I would commission a custom-made fren of my dreams, after planning the design for like 2 years,lol. I would go with a TWSBI 580 and have all the extra nibs! If I could only have one fountain pen it would be my Lamy 2000. A close second is my Franklin Christoph Model 45. While I love fountain pens, there are situations where it can't replace a pencil, and few situations when a pencil can't replace an FP. So I'll have to go with the Mitsubishi Kuru Toga Roulette. Only one pen? Would have to prioritize capacity and functionality. Lamy 2000. Pelikan m805 is a close second. Excellent giveaway, THANK YOU for the opportunity! That's an unfair question, only one pen or pencil. I can't possibly choose between my pens so I'll choose my favorite pencil: Palomino Blackwing 602. My Lamy Studio would be my one and only, if I had to make that terrible decision. If I could only have 1 pen it would be my grail pen Visconti Homo Sapiens Dark Age. If I could own only one it would be my Pelikan M200 (the Vanishing Point runs a close second!) I adore everything about the Pelikan! Hello, Oh gosh... as someone who still writes letters by hand and keeps a diary in a digital age for the fancy admiration of fountain pens and handwriting, I’m in love with the Leonardo Memento zero vintage brown, so stylish ans the chich copper and gold colored Namishu pens. Ok and the Edison pearlette canyon. Thank for letting me part of your passion guys! It feels like I'm betraying my pens but if it had to be one, I'll take my M400 White Tortoise. It's pretty, reliable, and has a good ink capacity. If I could only own one pen, it would be my lime green Pilot Metropolitan! If I could own only one fountain pen it would be my Pilot Metropolitan! Congratulations on the anniversary. If I could only own one pen it would be a Sailor Pro Gear with a medium nib. Nakaya Chinkin Pelmet in Shu with a stub nib that had nice springiness. I wish! This LEONARDO OFFICINA ITIALIANA MOMENTO ZERO FOUNTAIN PEN looks like a real beauty!What a great giveaway. Thank you for the opportunity, keeping my fingers crossed! While I first thought my sole pen would be a fountain pen, it may make more sense to choose something like a Karas Ink roller or Ti Arto EDC which take multiple refills including rollerballs, gels, ballpoints, and even five tips. kaweco al sport - pocket friendly! Thanks for the giveaway - if I could only own one pen/pencil, I'd be in big trouble - but I'd (probably?) go for a Pilot Vanishing Point. Kaweco Liliput in fireblue with a broad nib. If it were a pencil, then that would be the Perfect pencil from Graf von Faber-Castell.